Raven Black received crime fiction’s highest monetary honor, the Duncan Lawrie Dagger Award. Now Detective Jimmy Perez is back in an electrifying sequel. It’s midsummer in the Shetland Islands, the time of the white nights, when birds sing at midnight and the sun never sets. Artist Bella Sinclair throws an elaborate party to launch an exhibition of her work at The Herring House, a gallery on the beach. The party ends in farce when one the guests, a mysterious Englishman, bursts into tears and claims not to know who he is or where he’s come from. The following day the Englishman is found hanging from a rafter, and Detective Jimmy Perez is convinced that the man has been murdered. He is reinforced in this belief when Roddy, Bella’s musician nephew, is murdered, too. But the detective’s relationship with Fran Hunter may have clouded his judgment, for this is a crazy time of the year when night blurs into day and nothing is quite as it seems. 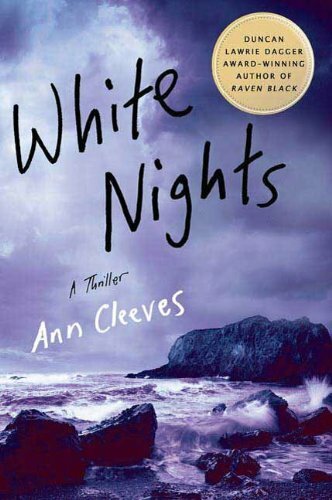 A stunning second installment in the acclaimed Shetland Island Quartet, White Nights is sure to garner American raves for international sensation Ann Cleeves. This series is the basis for the hit BBC show Shetland, starring Douglas Henshall, which attracted over 12 million viewers in its first two nights on the air. bookappeal (Grade: C) I have not read the first book in this series but I found the second to be a well-crafted mystery. Jimmy Perez is a distinctive character and the author reveals just enough about his past to keep him interesting. He solves the mystery by asking subtle questions and listening. The plot resolution was somewhat unexpected but well-explained. The story may move too slowly for some mystery readers but others will like the characterization and unique setting. SniffaCat (Grade: B–) A good cosy detective story, set in Shetland. Like the first book in the series (Raven Black) I enjoyed the characters and the setting. The story was addictive, although the ending felt a little rushed and the unveiling of the truth a bit out of the blue. I will be reading the next in the series.